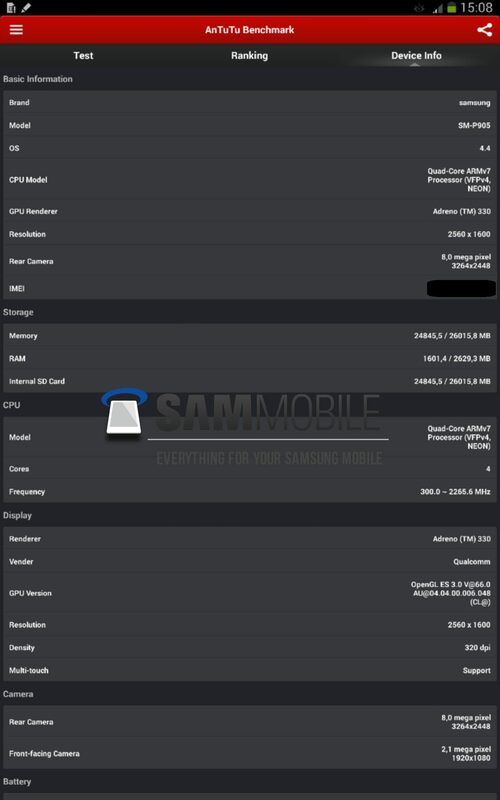 Samsung Galaxy Note Pro 12.2 tabletâ€™s specifications and Antutu benchmark details have emerged before the official announcement of the device, expected at the MWC 2014. A new Samsung Galaxy Note tablet is reportedly under development. Dubbed the Galaxy Note Pro 12.2, the top-end tablet is expected to be officially announced at the Mobile World Congress 2014 event. 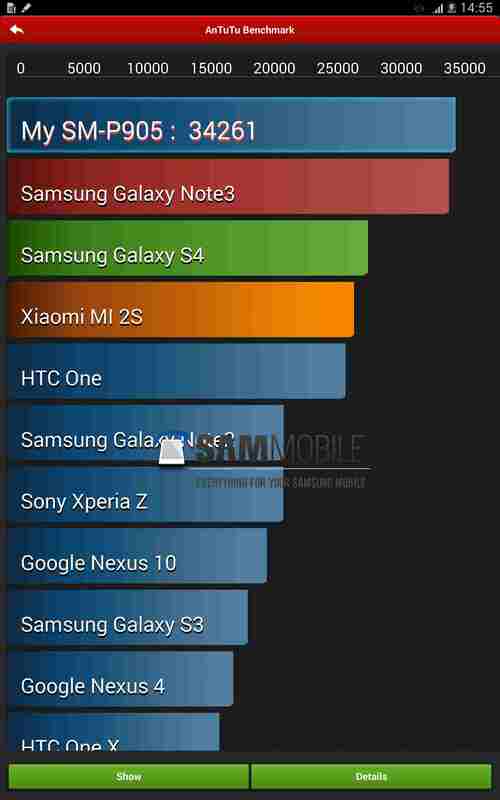 Information on specs and the benchmark performance of the Galaxy Note Pro 12.2 have already hit the web. There will be two versions of the Galaxy Note Pro 12.2 – Wi-Fi only and LTE-based. 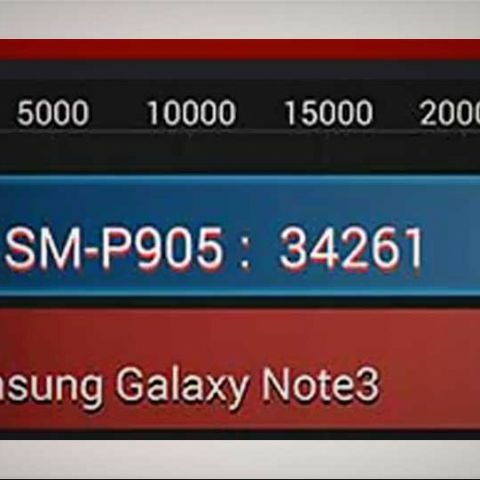 The LTE based version will sport the model number SM-P905, while the Wi-Fi only will be known as SM-P900. The Samsung Galaxy Note Pro 12.2 will sport a 12.2-inch with WQXGA resolution and 16:10 aspect ratio. The tablet will come with an S Pen. 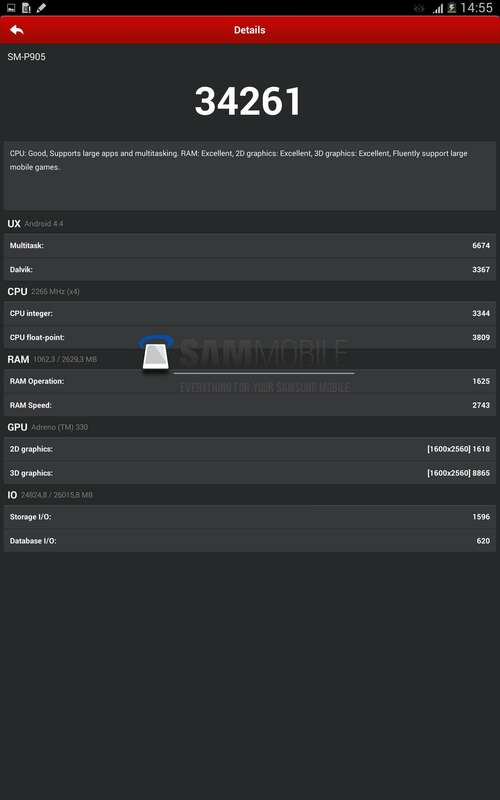 Leaked information suggests the SM-P905 will feature Qualcomm Snapdragon 800 8974-AA SoC with 2.3GHz quad-core CPU, Adreno 330 GPU, 3GB of RAM, 8MP main camera, and 2.1MP front-facing camera. For connectivity, the SM-P905 include Wi-Fi 802.11ac/a/b/g/n, NFC, Bluetooth 4.0, and IR blaster along with LTE. Specifications of the Wi-Fi only version haven't been revealed. The Samsung Galaxy Note Pro 12.2 will run on Android's latest iteration – v4.4.2 KitKat with TouchWiz UI. 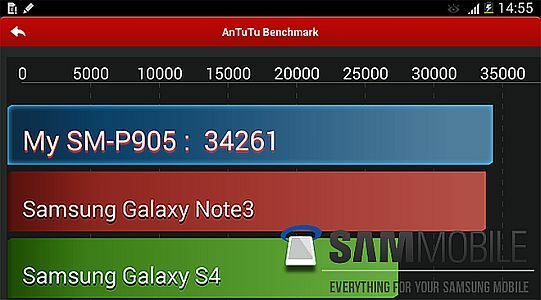 In the Antutu benchmark, the tablet manages 34,261 points, but on an experimental test software. Reports suggest the device can grab up to 40,000 points in the same benchmark if used a proper software. So far, there's no word on the pricing of the tablet. For more information, we'll have to wait for the MWC 2014, which kicks off February 24.